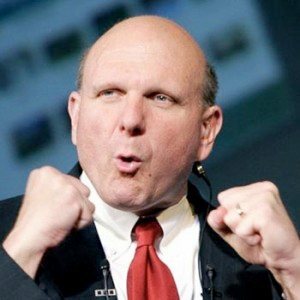 Microsoft CEO Steve Ballmer this week spoke during the opening ceremony of the headquarters building of the Microsoft Asia-Pacific R&D Group in Beijing, China. He talked about a lot of things, but one particular quote jumped out at us. Ballmer took a swipe at Google, saying the company "has taken a failed approach so far" to tablets. At the same time, he acknowledged that Apple's strategy with the iPad has been successful, according to The Wall Street Journal. Google hasn't been doing very well in the tablet space with its Android operating system so far, while Apple continues to push forward with the iPad. Still, the search giant is working hard to tweak the software it offers to its partners. Earlier this month, it released Android 3.1 (codenamed Honeycomb), an update to Android 3.0 (codenamed Honeycomb), the tablet-specific version of Google's mobile OS. Both have the same codename because Google acknowledges there isn't much difference between the two versions; it's mostly just enhancements and improvements. Microsoft may not be failing as Google is, but that's because it doesn't yet offer a tablet-specific OS. The software giant is hoping to change that with Windows 8, which is rumored to have two user interfaces, a new fast hibernation system, and be able to intelligently manage an SSD. That's great and all, but many are wondering whether the software giant is going to be able to successfully play catch-up. Even if Google's mobile OS is arguably not great for tablets yet, there are already projections for Android tablets to overtake the iPad, just like Android smartphones overtook the iPhone. Will Microsoft have to struggle to grab third place, like it currently is trying with Windows Phone?